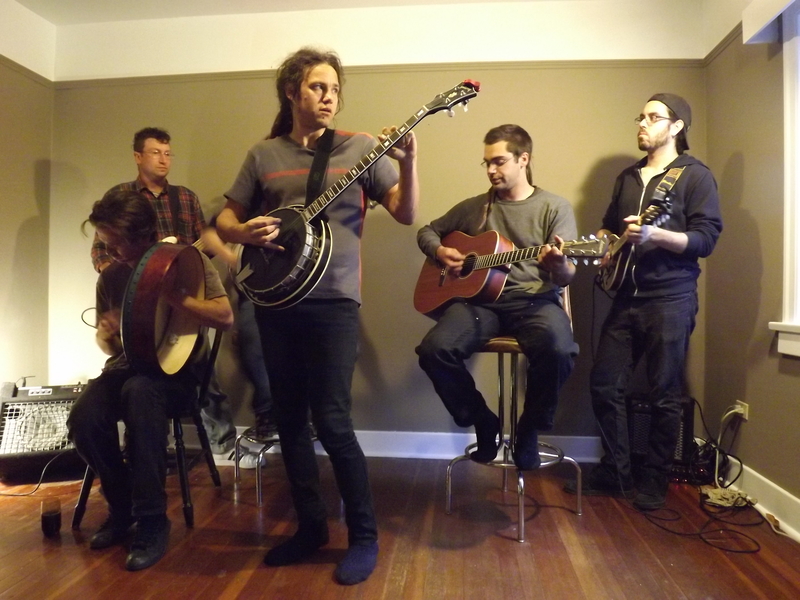 Friday, December 12, we performed at our home “The Dunsterville Horror” opening for Steph Cameron. Steph, an old friend of ours, traveled out to the island for a date with Buffy St. Marie(https://www.youtube.com/watch?v=brjfy-Yv9QU), so we snagged her for a extra date at the house. And what a great time it was! The house, due to renovations, felt, and looked, more like a construction zone than a home! Still we had a 50 liter keg of stout and a packed house making it a night, and morning, to remember! If you don’t know Steph yet you’d better check her out! She’s currently one of the best country folk artists in Canada. She recently signed contracts with Pheremone Records, from Toronto, and is now touring regularly. Check her out: https://www.youtube.com/watch?v=hCGsZnjgRzs you won’t regret it! Another past event was the McConnell family re-union gig which took place at the Metchosin Community Hall on Metchosin Rd. A beautiful old venue that certainly brought a nostalgic vibe to the show. This was a private event to celebrate a family visit from Australia. We performed for a 150 people, drank all night, ate great food, and danced with the kids! A great event. We are, by the way, always happy to play private events so don’t hesitate to get in touch. Other news: We have many dates coming up. 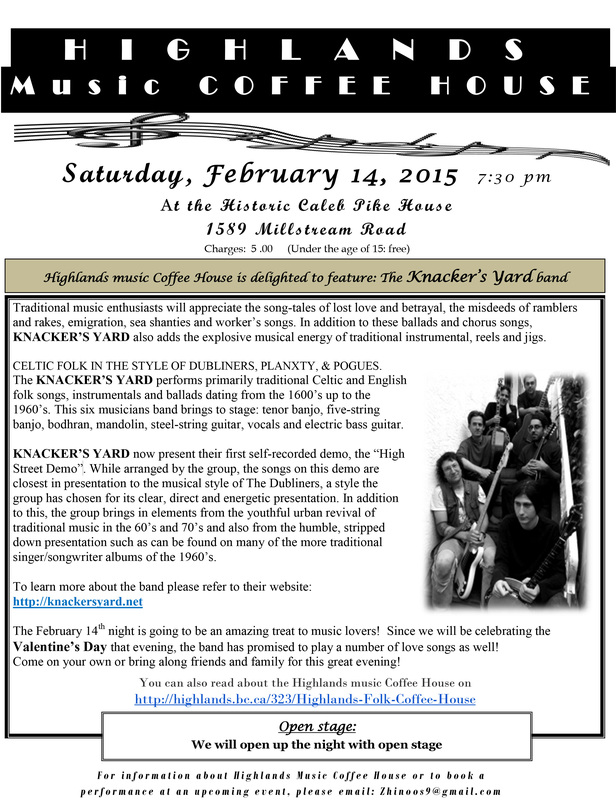 Including the Highlands Music Coffee House on Valentine’s day(see embedded poster). We’ll be performing some old love songs on that date including some by the great Scott poet Robbie Burns songs(http://en.wikipedia.org/wiki/Robert_Burns). Hopefully we’ll see you out! If you don’t know the Highlands Coffee House you should! They’ve been providing live folk music locally since 1998, thus celebrating their 15th year! You can check out their site and listings at: http://www.highlands.bc.ca/323/Highlands-Music-Coffee-House. Hopefully we’ll see some of you out for that! Also: We have a new guitar player named Jon who performed his first gig January 22nd at the Irish Times Pub. Welcome Jon! Special thanks to JP, our original guitar player, for filling in after Jon wiped out on his bike(a day before what was supposed to be his first performance a few months ago). Jon suffered a broken collar bone and some nerve damage, but now he’s back rehearsing and ready to play! On that note, Knacker’s Yard is currently seeking a bassist, since Devo left us a couple of months ago. We are open to either electric or stand up. Anyone who plays bass and is interested in what we are doing should drop us a line. We are also looking to add a pipe or violin to the ensemble. 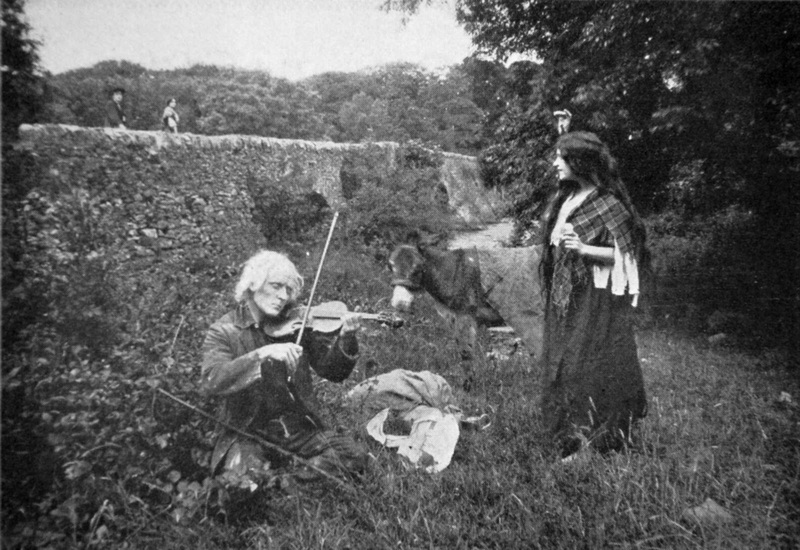 Anyone who plays fiddle/Celtic style fiddle, or tin whistle, can get in touch with us! Posted in Uncategorized on January 23, 2015 by knackersyard.